An airman was one of five medics and corpsmen who were honored last week at the 8th annual ‘Angels of the Battlefield’ gala sponsored by the Armed Services YMCA in Washington, D.C.
Senior Airman Taylor Renfro poses with her award with Gen. Larry Spencer. (Photo courtesy Meredith Resnick). Gen. Larry Spencer, Air Force vice chief of staff, presented the ‘Angel’ award on behalf of the Air Force to Senior Airman Taylor Renfro. 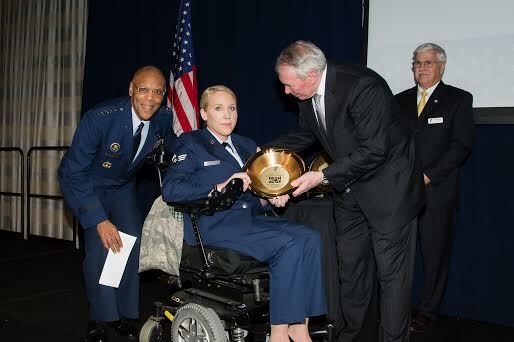 Renfro, 23, received the award for providing life-saving treatment during her career as an Air Force medic. Renfro herself was saved by another medic in May 2013 when her vehicle was hit by an improvised explosive device in Afghanistan. Severely injured, the Jacksonville, Ill., native was given only a 30-percent chance of survival. Since the injury, Renfro has spent her time at Walter Reed Hospital undergoing seven surgeries, with more to come. 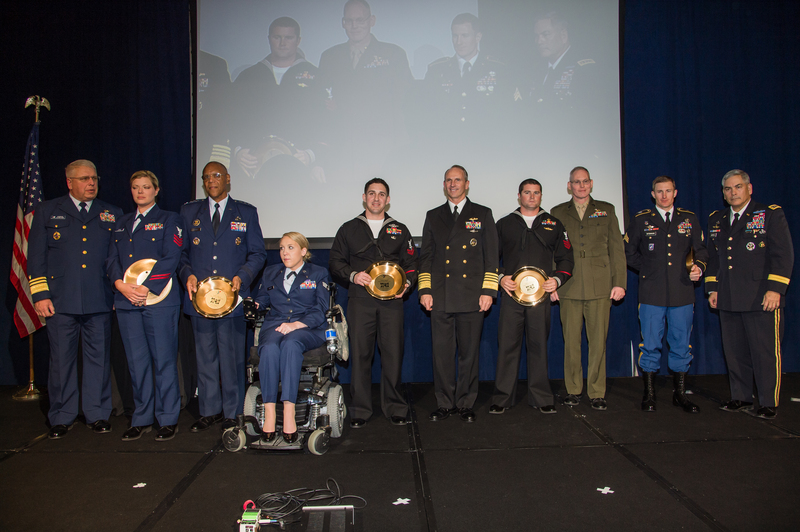 More than 300 guests, including senior military and enlisted service members, gathered on the honorees’ behalf. “Despite the monumental improvements in methods, technology, and techniques of medical intervention, it’s the faces behind the care that our wounded warriors ultimately recognize as their lifesavers . . . the heroes of the heroes,” said Vice Chairman of the Joint Chiefs of Staff, Admiral James Winnefeld, who delivered the keynote address. The “Angels” represent each of the five service branches of the U.S. military, and were chosen by their respective service chiefs. • Sergeant Kristopher Ritterhouse, a 26-year-old Army medic from Bullhead, Ariz., who continued to provide medical treatment for others, after being seriously injured himself in a battle in Afghanistan. Despite his own injuries, he returned to search for more casualties while under-fire. • Hospital corpsman 1st class Kevin Toland, a 32-year-old Marine corpsman from Atlanta, Ga., who triaged and treated patients saving many lives, when an IED hit a local bazaar in Afghanistan. • Hospital corpsman 2nd class Michael Marchante, a 26-year-old Navy corpsman from Murrieta, Calif., who treated a severely wounded soldier in Afghanistan while under active fire. Marchante used his body to shield the victim from further injury. • Health Service Nurse 1 Janet Combs, a 31-year-old Coast Guard corpsman from Miami Beach, Fla., who has treated hundreds of patients including two rescued from the water when their helicopter went down, a critical stroke victim, and many others. She is known for motivating her personnel and having compassion for her patients and their families. In addition to the gala, Armed Services YMCA, headquartered in Springfield, Va., provides specialized programs and support services to military service members and their families with a particular focus on junior-enlisted men and women, according to its website. Military involvement for the YMCA stems back to 1861, when 5,000 dedicated YMCA volunteers took to the battlefields of the Civil War alongside America’s uniformed young men. Today, with its 31 branches and affiliates, the ASYMCA operates more than 150 program centers nationwide. To learn more about ASYMCA, visit www.asymca.org. (left to right) HSN1 Janet Combs, SrA Taylor Renfro, HM2 Michael Marchante, HM1 Kevin Toland, and Sgt. Kristopher Ritterhouse hold their awards. Among them stand Air Force Gen. Larry Spencer; Gen. John Campbell, Vice Chief of Staff of the United States Army; Rear Admiral Brian Pecha, Force Surgeon, Marine Force Reserves; Admiral Jonathan Greenert, Chief of Naval Operations; Vice Admiral John Currier, 28th Vice Commandant of the USCG. (photo courtesy Meredith Resnick).